It’s the end of August and summer is just about over, and for some people, that means it’s back-to-school time. So watch out upcoming freshman! Avoid gaining the “Freshman 15” like I did my first year in college with The Dens Workout Plan. Step aside all you sweaty, buff, smelly boys… Girls can go in the weight room too! As you guys know from last week’s post, it was around this time of the year a couple of years ago that I started becoming a regular at the gym. Initially, Dens taught me this workout so I wouldn’t pack on the pounds, but now I’m still using it to stay in shape. So don’t think this post is just for the freshies goin’ off to college… this workout is meant for anybody who is avoiding any type of “15” weight-gain and for those who are trying to keep a tight figure. So all you freshman, work out beginners, gym-goers who need a new routine, and people who feel lost in the weight room… DRUM ROLL PLEASE! Behold… The Dens Workout Plan! Your warm up session should be about 10 minutes. You can choose any of the cardio machines because any of them will do the trick (treadmill, elliptical, bike, etc.). 1. Curls: When doing curls, make sure to keep your back straight and reframe from arching or hunching the back. Separate your feet shoulder-length apart and keep your elbows as close to your sides as possible. Then bring the weights up to your neck and extend your arms back down. Do these slowly to burn fat. For beginners, I recommend using 7.5 lbs. That’s what I did when I first started, but now I’ve bumped it up to 10-12.5 lbs. Use higher weights only when the workout has become too easy for you. For beginners, do about 10-12 curls. It may seem like a small number but your going to do this three times. Once you have become more advanced, bump it to 12-15 curls. I’m currently doing 15. Do 3 sets of these. 2. These Things: Again, make sure your feet are shoulder-length apart. Grab a weight, bring it over your head, and drop your forearms to bring the weight in between your shoulder blades. Make sure to keep your elbows in the same place throughout the whole exercise above your head. Nothing but you forearms should move. Then lift the weight straight up in the air and drop it back down to the center of your back. Do these slowly to burn fat. If you are new to the workout, start out with 10 lbs, then when your body has gotten used to it and you’re able to increase the weight, start using 12.5-15 lbs. 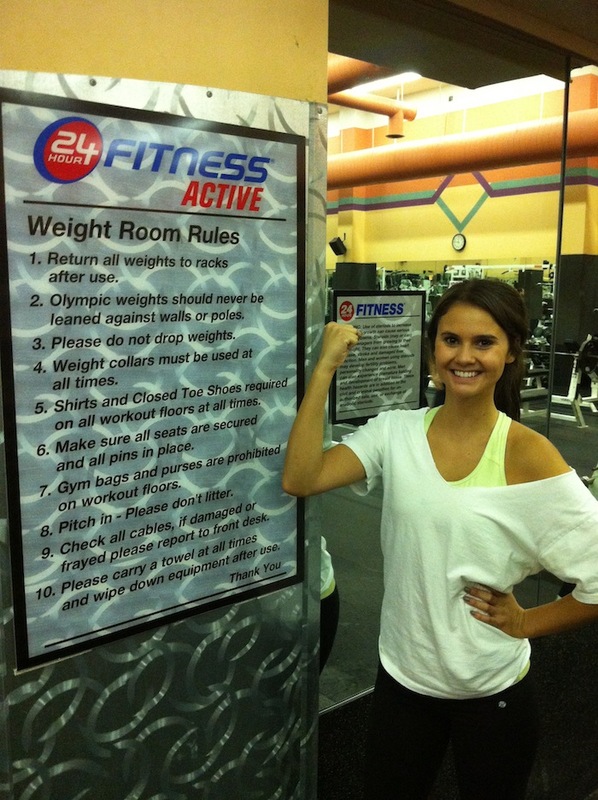 Just like with curls, I suggest that if you’re new to working out, do “these things” 10 times. Then when your more advanced, bump it up to 12-15 times. Usually I do 12, but on a good day I do 15 🙂 Do 3 sets of these. FYI- In college, every time Dens, Maggie and I were going over what we were going to do at the gym, we’d never know what to call this workout so we’d say, “Ok, we’ll start off with running, then curls, then these things,” while moving our arms up and down to show what we meant. That’s where it got its name. 3. Cheerleaders: Grab your weights and hold your elbows straight out in front of you with the dumbbells straight up in the air . Then spread your arms to the side like your flexing for the gun show. Make sure your arms only go to the side and don’t bring your elbows/arms behind your back. Be sure NOT to drop your elbows as well. Then push the weights straight up in the air above your head. Do these slowly to burn fat. Then repeat. Beginners should use 7.5 lbs. When you are more advanced, start using 10 lbs. First start out doing 10 reps of these, then when it’s time, bump it up to 12-15 reps. That’s what I do now. Do 3 sets of these. When doing lunges, make sure you leave enough room between your legs so when you do the lunge, your knee doesn’t go forward past your ankles. As you lower your body, make sure both legs come to a 90-degree angle. Inhale as you go into the lunge and exhale when you come back up. Make sure to switch off legs. Do these slowly to burn fat. Beginners start off with 7.5 lbs. and when you are able to, start using 10-12.5 lbs. Personally, I think 12.5 lbs. is too heavy, so I use 10 lbs. If you are a beginner, do 5-8 lunges on each leg. If you are more advanced, do between 8-10 on each. Do 3 sets of these. Keep your legs shoulder-length apart. DO NOT let your knees go forward past your feet! That can do damage to them. You want to keep most of your weight in the back of your heals for balance and pretend you are sitting in an imaginary chair. That’s how far you should go. And make sure to keep your upper body tall and your back straight when squatting. When you go down, stick your bum out as far as you can too. Do these slowly to burn fat. Beginners start off with 10-15 lbs. When you are at a more advanced level, pump it up to 20-25 lbs. Currently, I am doing 20 lbs. Whether you’re a beginner or not, you should be doing 3 sets of 8 with these. No more or no less. Grab a weight and hold it on one side. Let’s just say you hold it with your left hand to your left side. Stand on your toes on your right foot and go up and down. Your toes never leave the floor, you simply just stand on your tippy toes and go back down. Do the same with the other side. Beginners use 15-20 lbs and do 20 reps. When you’re more advanced, start using 20-25 lbs. and do between 20-30 reps. That’s what I’m doing now. Do 3 sets of these. For the record, I did not come up with this name. I’ve heard personal trainers use it all the time and you’ll know why with these pictures. But these leg workouts are pretty straight forward since they are on a machine, so take a seat and spread your legs. There are two of these machines though so make sure you do both. One you push your legs out and the other you push them in. Do these slowly to burn fat. This one you push out. Beginners, you should use 30-50 lbs, and if you are more advanced, you should do 50 lbs or higher. I currently do 60 lbs. This one you push in. Beginners should do about 10-12 of these, and more advanced people should do between 15-20. Do these 3 times. Umm… does this good girl, bad girl machine belong in the gym… or delivery room? Grab a weight and keep your feet shoulder-length apart. Then do not move your legs, but tilt your upper body to the side (like you’re doing crunches but on the side) bringing the weight lower down your leg. Then bring yourself straight back up. Make sure to keep abs tight while doing this and do them slowly to burn fat. Beginners should use 12.5-15 lbs. Advanced people should bump it up to 15-20 lbs. Beginners do 15 on each side and advanced people do 15-20 each. Do each side 3 times. Grab a yoga mat and lay flat on the floor facing upward. Place hands under your bum with your palms on the floor, fingers toward your feet. Extend your legs up and bring them to the floor. The closer your feet get to the floor the better it is for the abs. And don’t worry about keeping your legs completely straight when you bring them up because they can be slightly bent. Beginners try doing 10-15 of these. Then when your more advanced do between 20-25 of them. Do 3 sets of these. There are two kinds that I do. The first one are normal crunches where your legs are up in the air at a 90-degree angle. Place your hands behind your head, and with your abs, bring yourself up forward as much as you can. Start off doing 40 of these, then add more when you feel you are able too. Currently I do 50. Do 3 sets of these. The second kinds are laying-down crunches. It’s the same concept as the regular crunches, but instead of keeping your legs at a 90-degree angle, you lay them flat on the floor with your toes pointing up. Same with the other crunches, start out with 40 and then boost it up. I am currently doing 60 of these. Do 3 sets of these. As you remember in my last post, finish off your workout with a cardio session at the end, because like I said, cardio post-workout burns more fat than pre-workout. 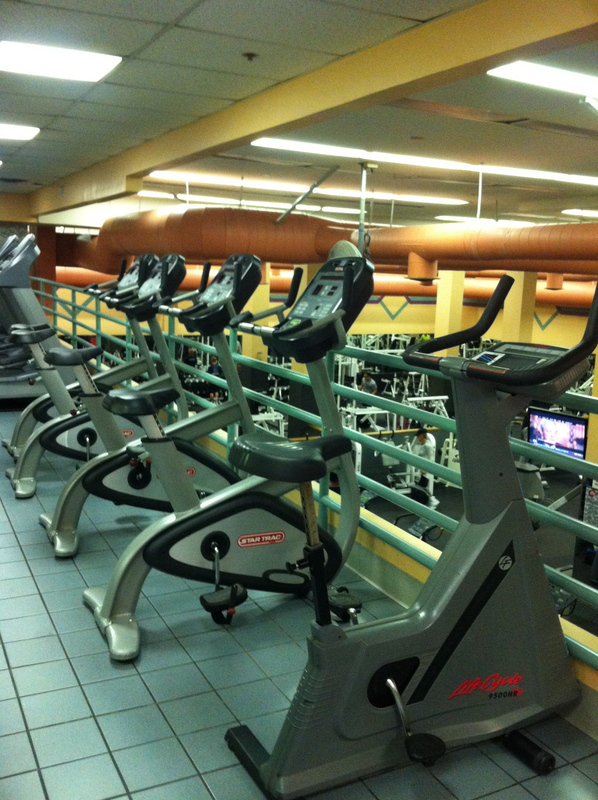 And just like with the warm up, choose any cardio machine because any of them work. For me, I like to do 20 minutes on the bike and 10 minutes on the treadmill (total of 30 mins). Switch off arm and leg days. Don’t do both in one day. When doing arms I go in this order: curls, these things, then cheerleaders. Then I start over and do them two more times instead of doing curls 3x, these things 3x, and cheerleaders 3x. Same goes for leg and ab workouts. Make sure to break a sweat! If you don’t, boost it up by doing more or adding more. REMEMBER, using less amount of weight with more reps is better than more weight and less reps. If this workout causes you pain (not soreness), don’t do it. *All photos were taken by photographer Richard Urwin Wheeler.